Hello there again. It’s been a while. Last time, I wrote about ouchan, our monorepo for Go-based code. 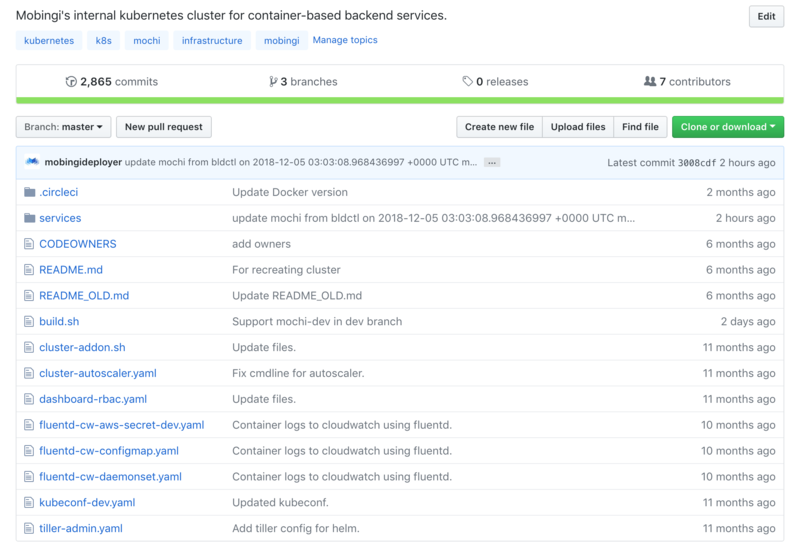 In that article, I briefly mentioned mochi*, which is what we call our Kubernetes clusters where most of our backend services are running on. We use GKE to run these clusters across three zones in Tokyo region. At the moment, we have three clusters, each for development, staging, and production. Each environment is mapped to a specific branch: master, qa, and production, respectively. Mochi contains all the YAML files, environment variables, credentials, and other configuration files for all of our ouchan services. It also has its own build system which is responsible for recreating and tearing down these clusters, which really is the main point of mochi: having the ability to tear down and recreate our clusters with minimal to no intervention. We actually started mochi around December last year using AWS and the awesome kops tool. We had it going for a couple of months but in the end, cluster management was too much for us so we moved to GKE even though we are still pretty much an AWS shop. The only services we use in GCP are GKE, PubSub, and StackDriver.